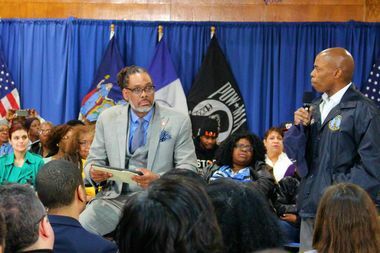 Brooklyn Borough President Eric Adams (right) speaks about homeless shelters at a Bedford-Stuyvesant town hall meeting in March. Adams criticized the mayor's Department of Homeless Services plan, but is now helping to hire a new city worker to facilitate a better relationship between residents of Central Brooklyn and homeless shelters. CROWN HEIGHTS — As some neighbors of two planned Crown Heights homeless shelters fight to block their openings, city officials hope to mend relationships between shelters and residents by hiring a full-time Director of Community Partnerships to manage problems and volunteer efforts. The Department of Homeless Services-funded job will focus on area shelters in Central Brooklyn, particularly at new facilities that are among the first of 90 new facilities proposed by Mayor Bill de Blasio. The idea for the new, year-long position — now open for applications with a salary in the range of $39,000 to $65,000 — came from Brooklyn Borough President Eric Adams who brought the concept to DHS Commissioner Steven Banks after hearing from Brooklynites who wanted to to lend a hand at local shelters. Adams envisions the director as someone from the community who will be the point person for all area shelters, helping to facilitate volunteering, getting to know leaders at churches, schools, block associations and businesses to make sure DHS facilities are running smoothly. “They’re going to make sure these providers, these shelters, are living up to their promises,” Adams said. That could include following up on noise complaints, enforcement of security protocols, or taking reports of crime at existing shelters — such as the notorious Bedford-Atlantic Armory, Adams said — to the NYPD. The 350-bed shelter at the Armory has long been a nuisance to locals. According to a report in the New York Daily News this week, robberies are up around the facility despite an increase in peace officers deployed there. The job is part of a “supportive plan” Adams envisioned in a recent op-ed published by Our Time Press. But the borough president was clear: the new hire would not be in the public relations business. “Their job is not to sell the shelter to communities. That’s the job of City Hall,” he said. The position will be based at Brooklyn Borough Hall and the borough president will be involved with the hiring process for the new “Community Partnerships” role, but the new role will be part of DHS, according to DHS spokesman Isaac McGinn. “This role is an example of how we’re finding new ways to ensure transitional housing facilities are integrated into communities so that our homeless neighbors feel welcomed and supported by the community as they stabilize their lives,” he said. Candidates with experience working in Central Brooklyn will be prioritized, DHS said. Hiring for the role will take place in the next several weeks, according to Borough Hall.